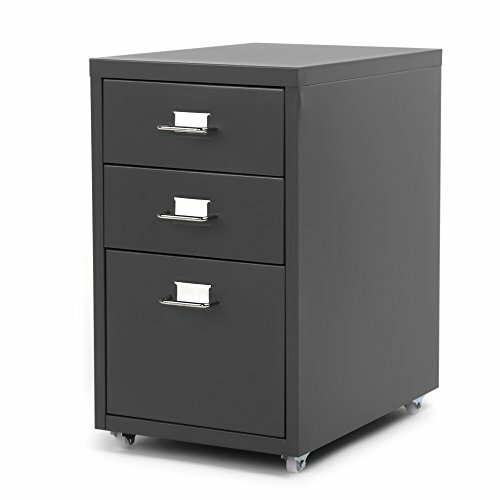 This detachable metal filing cabinet with 4 free moving ball wheels and 3 large sliding suspension drawers is constructed from 0.4 & 0.5mm thickness cold-rolled steel fit for daily office and home usage. It's widely used for office, household, suitable for bedroom, living room, kitchen, dining room, etc. 3 labels included for marking contents of drawers. Slots for label on each drawer so you can easily keep things organized and easily find what you are looking for. Vertical file cabinet with 3 metal drawers, large space. Sliding suspension in smooth and quiet drawer performance. Cold-rolled steel construction with thickness up to 0.5mm, anti-corrosion, waterproof and dustproof. Chrome plated handle, smooth, anti-corrosion, and durable for your frequent use. Width: 11", depth: 16.1", height:18.9". Easy to assemble, clean & care with detachable design, 4 casters make it easy to move around even on carpet floor.